Need a quick, low-mess craft for Valentine’s Day? 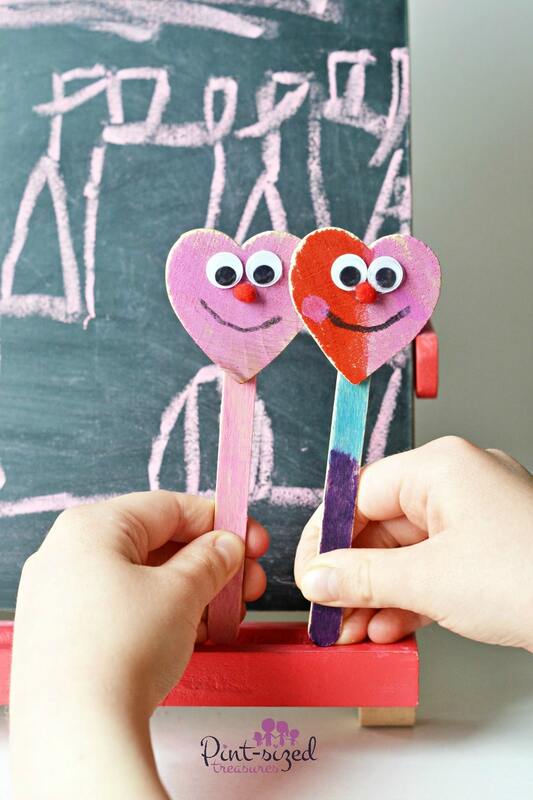 These heart-Shaped craft stick puppets are super cute and simple to make. And we all know that simple, last-minute crafts are the best kind, right? You’re going to be breaking out the paint for this craft which the kids will LOVE! Anyone else with kids who get really excited about paint? I promised low-mess and low-mess is what you’ll get. This particular paint is clean, convenient, easy-to-use, and non-toxic which I know you moms out there will LOVE! No brushes, water, or paint smocks are needed. All you need are Kwik Stix! I told you this would be low-mess. You may remember this art supply from the Leaf Silhouette Craft I shared in the fall. Now there are Thin Stix, and just like the original Kwik Stix, they are solid tempura paint sticks that dry in 90 seconds. Did you read that? 90 seconds. That’s music to a mom’s ear! The Thin Stix allow you to paint with finer detail without the mess. And they work beautifully on canvas, poster boards, paper, and cardboard. 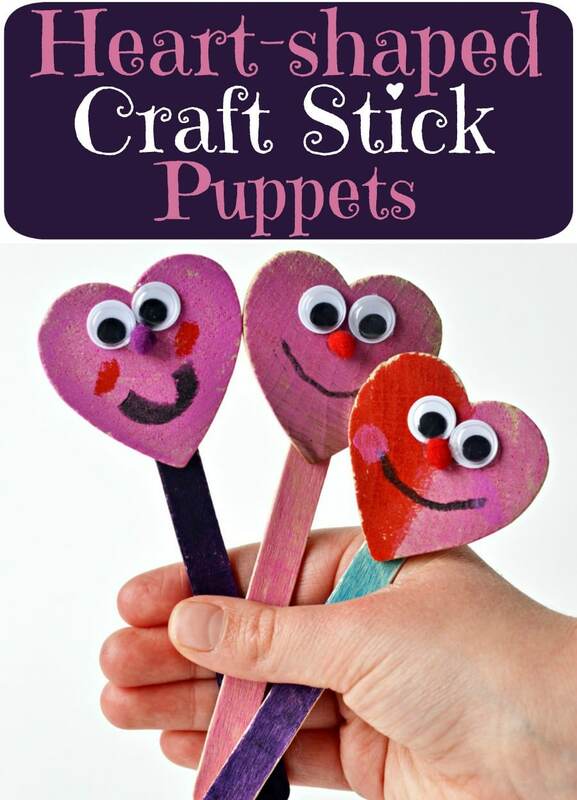 They even show up bold and vibrant on wood which makes them perfect for this craft stick puppet activity! 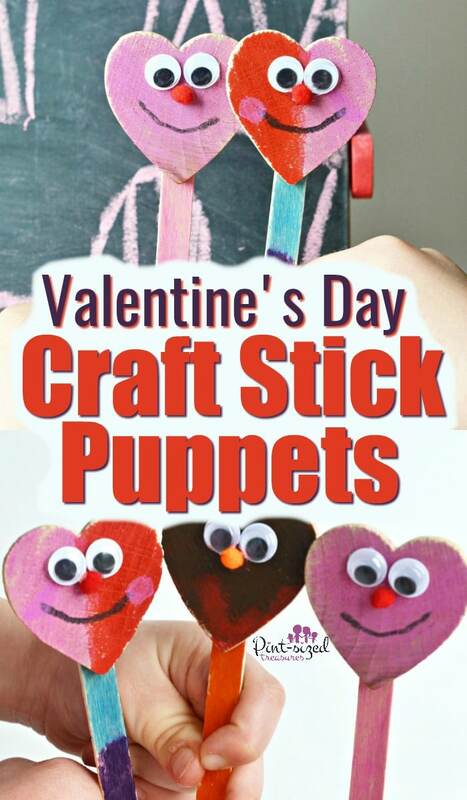 These heart-shaped stick puppets are ideal for fostering creativity and imaginative play. And here’s some more DIY puppets you can make! They are also great for building fine motor skills as kids pick up googly eyes, place pom poms, and paint fun faces on their puppets. The fun doesn’t stop with creating the craft stick puppets, though. Kids can draw backdrops on a chalkboard or even use the paint a vibrant scene. The fun continues as they use their puppets to put on an exciting show! Kids can even use craft sticks for fun learning activities like these! Ready to try this activity with your kids? 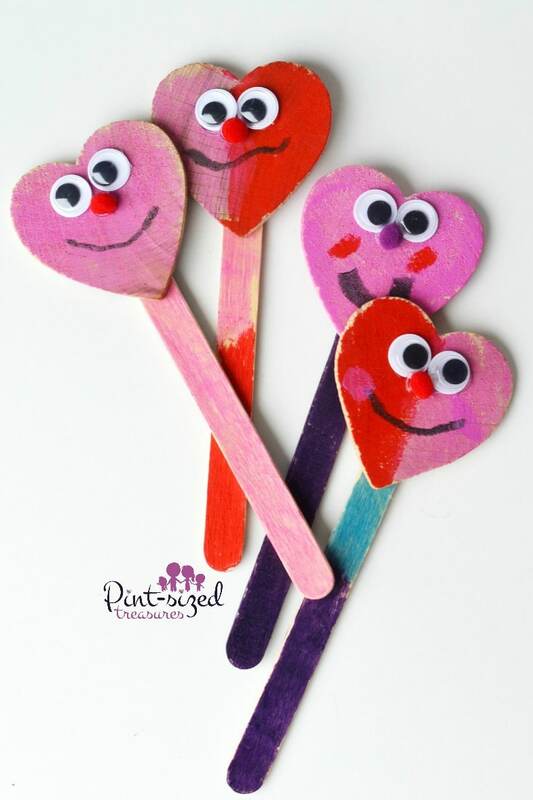 Use Kwik Stix Thin Stix to paint popsicle sticks and wooden hearts. Let them dry. It doesn’t take long, though. The Kwik Stix tempura paint dries in 90 seconds. Faces can be drawn on the hearts with the Kwik Stix Thin Stix or google eyes and pom poms can be adhered with craft glue to make the facial features. 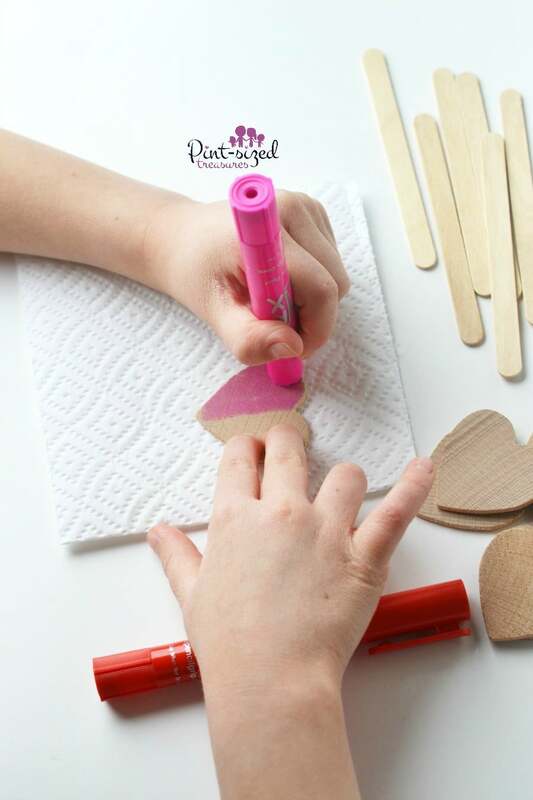 Once the face dries, use a hot glue gun to attach a popsicle stick to each finished heart. Moms of small children will want to do this step. That’s it! Now it’s time to play with your stick puppets! Do you have a craft in mind that you’d like to create with Kwik Stix Thin Stix? They are available in 6, 12, and 24 packs of assorted, neon, and metalix colors. 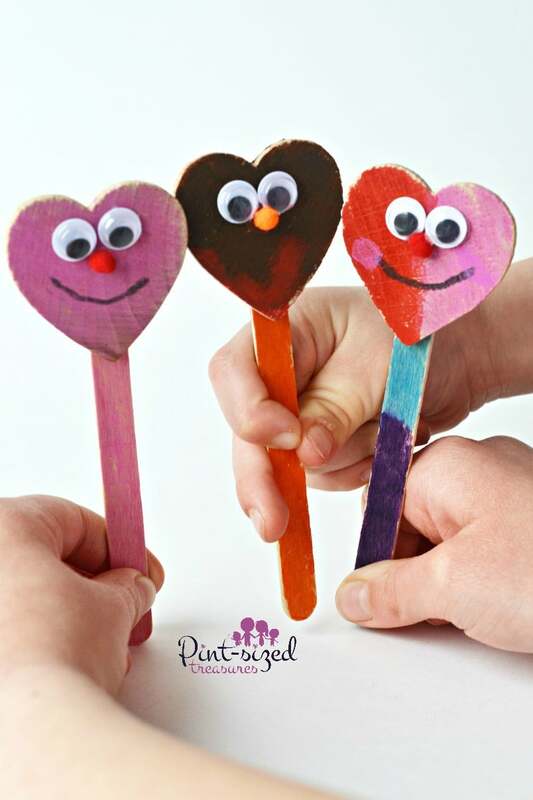 These heart-shaped craft stick puppets are a fun craft to try with them, but the possibilities are limitless with this low-mess craft supply! Thanks to Kwik Stix Thin Stix for sponsoring this post. All opinions are my own.